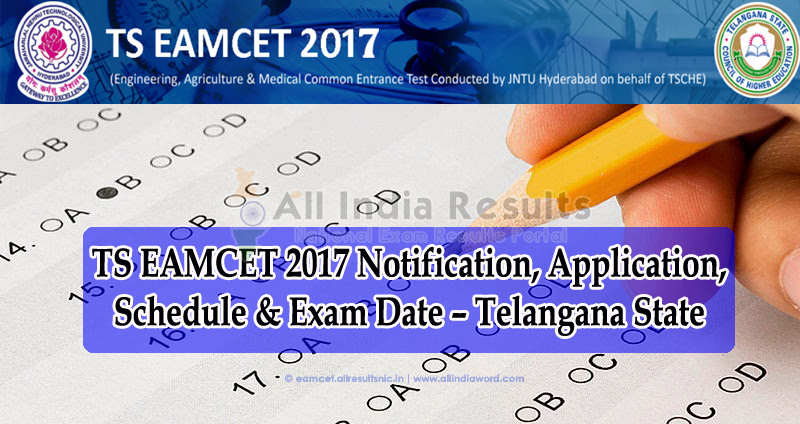 TS EAMCET 2017 (Telangana State Engineering, Agriculture and Medical Entrance Test) is a state level entrance exam organized by the Jawaharlal Nehru Technological University, Hyderabad on behalf of Council of Higher Education (TSCHE).This entrance exam is conducted for providing admission into first year of various UG professional courses in the field of engineering, architecture, agriculture, etc. All universities and private colleges located in Telangana consider the score of this examination for offering the admissions in said courses. Here, candidates can get the details about TSEAMCET 2017 including application form, eligibility, exam dates, syllabus, etc. 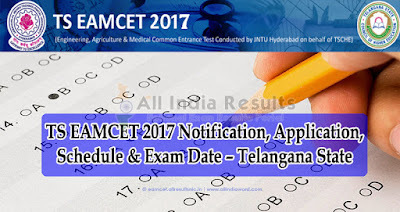 The schedule for Telangana EAMCET 1 and EAMCET 2 (Engineering,Agriculture and Medical etc.) will be released by the officials. TS EAMCET Application Form 2017 will be provided from the last week of Feb 2017. Candidates must be passed or appearing their 10+2 or equivalent examination with Physics, Chemistry, Zoology and Botany as optional that includes practical test. (i) Engineering (E) 10.00 A.M. to 1.00 P.M.
(ii) Agriculture and Medical (AM) 2.30 P.M. to 5.30 P.M.